It's finished! I feel a bit bad, as this quilt has been sitting and waiting for it's binding for a few weeks now. I knew I wanted a specific pink (Kona Carnation) but the kids were sick so I couldn't get to my LQS until today. I'm happy I waited though, rather than using something else I had on hand, because I sure do love how it turned out. Last July I scored a layer cake of Dream On by Urban Chiks on eBay (Buy it Now - I'm not good at auctions). This line will be available in yardage this fall...probably any week now. They've recreated vintage sheets. 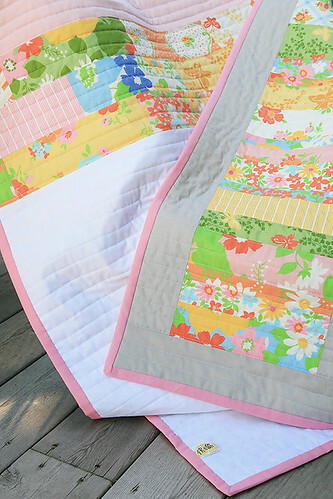 I love this line because I don't have to collect a lot of sheets to get a mix-and-match feeling of prints. I think the wide stacks is a perfect design to show off the prints. 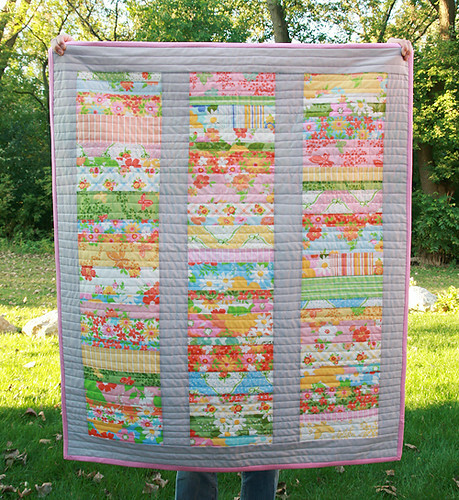 The sashing is Kona Ash, a new favorite for sure! I quilted this one with straight horizontal lines, between 3/4" and 1-1/4" apart from each other. 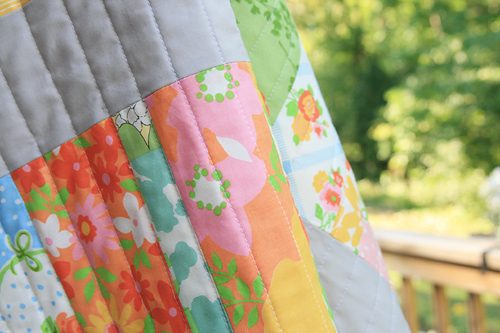 The coins are also varying heights, so I think the quilting works with it. For the backing I used a light Kona pink...it was a scrap so I'm not entirely sure the color. And then the bottom is Kona white, which really makes the prints pop. 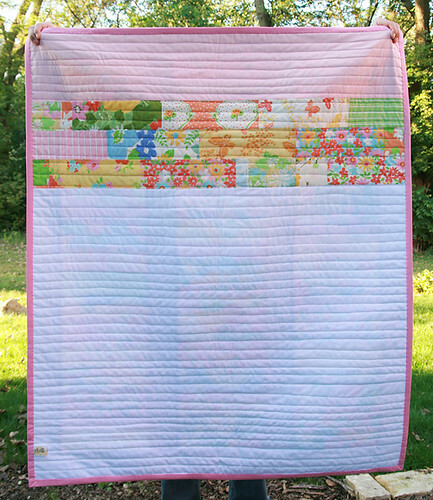 The final quilt measures 40" x 46" and will be listed in the shop soon! Perfect crib size for a little girl. And now for the giveaway! I have a lot of strips leftover. I'm not sure why I thought I'd need the entire layer cake cut up, but I did! So I'm giving them away. :) If you would like to win them to make your own Stack of Dreams coin quilt, simply leave a comment below. I'll be selecting a winner Monday morning (Oct 4th). Good luck everyone! ** Update ** Random.org selected a winner for me this morning - it's Cara @ Me? A Mom?! I'm sure this will become something beautiful for those girls of yours Cara. I'll be contacting you for your address - enjoy!